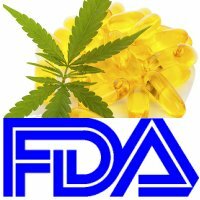 The USA’s Food and Drug Administration (FDA) has again sent out warning letters to some vendors selling cannabidiol products (or claiming to); a compound found in cannabis. Cannabidiol, more commonly referred to as CBD, is a non-psychotropic compound that is showing promise in the treatment of certain conditions; including some forms of epilepsy and to manage the symptoms of multiple sclerosis. Early indications are it is also generally free of serious side-effects; but much more research and testing is required. A thriving CBD industry has already sprouted, spruiking the benefits of CBD and selling cannabidiol oil either on its own or incorporated into other products. Some of the vendors are guarded and cautious about claims, others practically tout it as a cure-all. This has gained the attention of the FDA, which has again begun warning vendors about the sale of CBD after a previous sweep last year. While the more careful vendors promote it as being a dietary supplement, the FDA disagrees. It concluded last year based on available evidence that CBD products are excluded from the dietary supplement definition under section 201of the Federal Food, Drug, and Cosmetic Act. “Under that provision, if an article (such as CBD) has been authorized for investigation as a new drug for which substantial clinical investigations have been instituted and for which the existence of such investigations has been made public, then products containing that substance are outside the definition of a dietary supplement,” says one of the warning letters. While there is an exception where a substance was marketed as either a supplement or conventional food before drug investigations got the nod, the FDA says this isn’t the case for CBD. … however, the operative word is “may”. In total, eight letters have been issued in February. The products involved were also tested and some were found not to have any CBD content at all. Making the issue more confusing for consumers is that cannabidiol is now legal in a number of U.S. states; although restrictions on its procurement, possession and use can vary greatly between states.